Last week, U.S. News and World Report released its list of the best high schools in America. A quick glance at their list reveals that the best schools are also home to the highest concentrations of kids coming from affluent homes where parents, like me, spend thousands of hours from the time our children are in the womb doing everything possible to ensure that they are ready for college and life by the age of 18. The Michigan Department of Education produced a similar “Top to Bottom” schools list for every school in Michigan. The neighborhood we serve historically has some of the highest child abuse rates, the highest juvenile crime rates, and the highest homicide rates in the state of Michigan. Care to guess how the five high schools in and near this community rank on the list? At the very bottom. Two of those five high schools completely revamped themselves four years ago with new principals and virtually all new teaching staffs when they entered the Education Achievement Authority. And still no significant difference. Would the results be any different if we brought in the leaders and teachers from Troy High School or Gross Pointe South—two of the “Top 10” schools in Michigan? I think not. Our members go the “failing” schools in this neighborhood. They are funny, caring, resilient kids. Many of them overcome more adversity in a week than my own kids do in a year. But we call their schools failing; place the blame on their teachers, mostly ignore the kids who go there and somehow expect things to get better. Things won’t get better until we do things differently, and there’s only so much that can get done in the schools. Young people need more people in their lives after school, loving them, challenging them, and giving them the one-on-one support many kids take for granted at home. 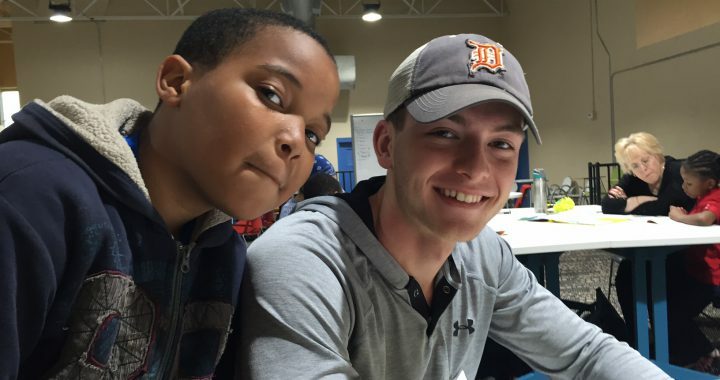 This is what happens here every day, especially on Tuesdays and Thursdays when people from as far as White Lake, Michigan and as close as a few blocks away come to volunteer as Reading Mentors to our young people. They are changing the game. 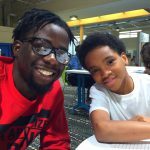 LaRuente Gary, who grew up in the neighborhood around Lipke and now works at the Chrysler Truck Warren Assembly Plant, recently joined our Reading Mentors team. He is with David here. 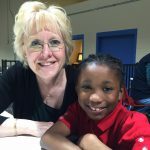 Ms. Koday, a GM retiree and active volunteer, with Navaeh. 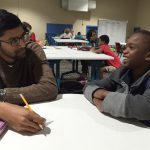 Harsha Ailes, an engineer at the Chrysler Mound Road Engine Plant, also teaches guitar and coaches soccer. He’s here with Niayah. 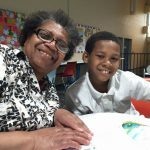 Ms. Harris, a long-time community advocate, with Jeremiah.